Thanks to Don Morgan for his guest blog last week, featuring his novel Sourwater Slough. I almost felt I was back home in Oklahoma. This week, let’s have a short story that comes in two parts. I hope you enjoy it. Wally Hamner was the proverbial “boy next door,” the guy who was always there. We grew up together like that… next door. "Two peas in a pod," my dad used to say. We played together in diapers and in shorts and in big boy long pants. We were buds even though he had me by a year. It hurt a little when he got interested in sports and developed other friendships. But I adjusted and came to grips with it. What I had that the others didn’t was proximity. Proximity and history. It was easy to hop the fence and join me in the back yard and pick up a conversation from yesterday or the day before after he returned from this excursion or that. We talked with an ease that neither of us had with anyone else. I knew his ambitions—to be a fighter pilot—as well as his aspirations—to marry Mary Sue Klonheim and build her the biggest house in town. I knew his fears—snakes—and his joys—double chocolate milk shakes in addition to Mary Sue. The summer between our junior and senior years, respectively, I came to comprehend how I served him. I was his conscience, the brake to his recklessness. I was his anchor. Strange, because he was older than me. Maybe it was because I wasn’t willing to jump out of a moving car on a dare or let someone shoot a pencil out of my mouth. I wasn’t as audacious as he was. I was the one to back off when things went too far. One of the best things about Wally was that even if he didn’t follow my example, he respected it and never talked down to me because of my natural passivity, as he called it. He’d always say something like “Oh, come on, Bobby, what’s it gonna hurt?” But when I balked, he never held it against me. Still, I suspected that was why he turned to others as we grew older. By that summer, Wally had the reputation of being wild, at least among the adults. Ours was a small town where neighbors knew everything there was to know about neighbors. The fact that I couldn’t go too far overboard without my folks learning about it made me feel safe, but it chafed Wally. The budding fighter pilot in him wanted to break the bonds of small-town boundaries and soar. So it goes without saying he was usually in trouble to some degree. Because of his venturesome nature, it was strange that my folks never tried to put the kibosh on our friendship. And his mom positively glowed whenever I came over. I didn’t get it then, but she probably figured my level-headedness to be a blessing. Funny how folks look at the same thing and see it differently. Wally considered it as timidity. 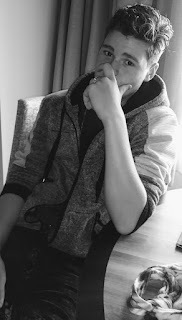 As we approached that last school year before he’d go off to college, the age difference between us didn’t seem so big as it had awhile back. More often than not, Wally invited me to hang with him and his jock buddies, and I did. But it wasn’t a comfortable fit because I was the naysayer, the wet blanket, the raincloud hanging over the group whenever they wanted to drag race or take a plunge off the cliff on the south side of Webber’s Lake. Or worse yet, when they boozed before racing or jumping off the cliff. As we ate fried chicken and “fixin’s” and listened to Helen whine about this or that, my eyes continually strayed to where tiny figures cavorted atop the cliff. Occasionally, someone dove into the water, exciting “oohs” and “ahhs” from those of us who happened to see. There was talk of how dangerous that was and whether we should send a deputy sheriff—who was eating with his family a couple of tables away from us—to put a stop to it, but nothing came of such talk. Others on this side of the lake had seen the fall as well, and the deputy was finally dispatched to check out the situation. By now, most of the boys on the cliff-top had joined others in the water and clustered in a group at the bottom of the bluff. My heart fell into my stomach as a heavy sense of foreboding pressed on my heart and rendered me dizzy. My blood seemed to have pooled in my shoes, rendering me incapable of doing anything besides sag against the concrete picnic table and gasp for breath. My dad and Mr. Hamner raced for the shore and jumped in one of the boats taking off across the lake. As I tried to stand, Mrs. Hamner restrained me. The haunted look in her eyes sent chill bumps sweeping over me. “Was it him? It-it was Wally, wasn’t it?” I stuttered. Well, was it Wally who fell? Or was it one of his friends, which might hopefully knock some sense in Wally’s head. Tune in next week and see. Now my mantra: Keep on reading and keep on writing. You have something to say, so say it! This week, fellow author Donald T. Morgan gives us the Prologue to his unpublished novel Sourwater Slough. 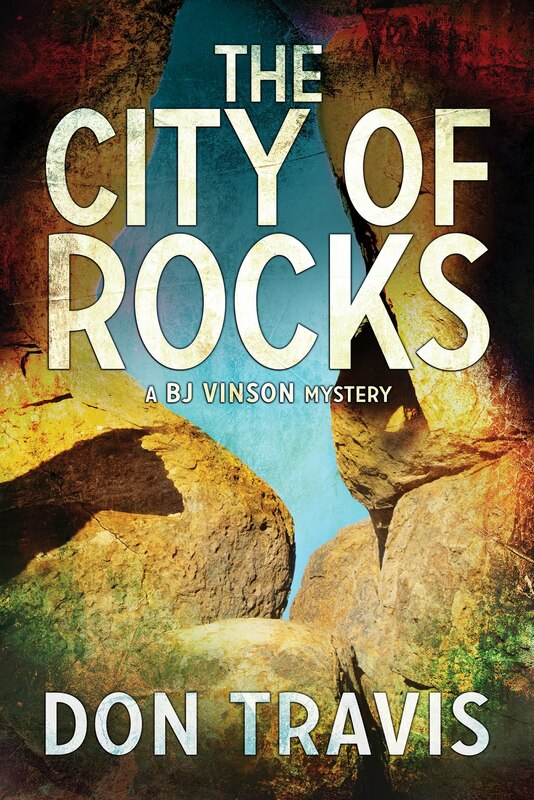 Set in southeastern Oklahoma (my old stomping grounds), the book is a murder mystery. Let him know if sounds interesting to you. Sucking putrid swamp air into his lungs in desperate, spastic gasps, he stood over the inert body. The rage of a moment ago dissipated like a dandelion riding the wind. Hands dangling at his sides, fingertips twitching, he swayed as his hammering heart slowed abruptly. Reality returned in the faint drip of water somewhere nearby, in the smear of blood on the rough, curling bark of the tree, in the rank stench of the bog. “Come on. Get up,” he said in a near whisper. Aw, hell. She wasn’t gonna get up. Ever. Oh, man, what now? It was an accident. Her fault. Anybody could see that. Anybody but that fat Malcolm County Sheriff, Joe Lee Buchanan. That redneck wouldn’t buy it. Not for a minute. He’d just wanted to get it on. That’s what they’d come down here for—or he had, anyway. Wasn’t like they hadn’t done it before. Why’d she have to go squirrelly just because he brought her to the slough? She was usually a good sport, up for doing crazy things. When she’d bailed out of the truck in a snit, he’d laughed at the awkward way she skied in the mud. He got out and grabbed at her. But when his hand hit her shoulder, she went down in the slick sludge, banging her head on the bole of a tree. His shoulders rose and fell in a sigh. God, she looked funny lying there. Too bad, but she ought not have treated him like dirt. The words echoing hollowly across the surface of the slough made his skin go clammy. Didn’t sound like his voice. More like a stranger’s. Was somebody in his head talking for him? A splash down the shoreline puckered his flesh. He peered through the late afternoon haze. Fishermen? Frog giggers? But nothing stirred in the oppressive heat. Not a leaf. Just swarms of gnats and flies. Sourwater lay silent and mysterious, looking more like a pool of dirty motor oil than water. A thick canopy of branches overhead almost obscured the low bank of clouds hiding the sun. The heavy atmosphere made it hard to breathe. The bog reeked of death and decay. What the hell was he gonna do now? Ripples near a cypress knee poking out of stale water morphed into a snake. The ugly moccasin gave him an idea. Nobody knew he’d brought her out here. He’d just leave her for the swamp. His great-granddaddy used to talk about a big alligator down in the bottoms. That sucker would take her for sure. Clean up after him so nobody’d ever find her. That was the answer. The slough knew how to take care of its dead. He frowned. Was that why he chose this funky place? Some fort of premonition? A clap of thunder overhead and an answering rumble off to the south freed him from inertia. He slogged through the mud to his pickup for something to weigh her down. Rope was no good—too distinctive. Lots of cases got solved with nothing more than a hair. Watching “CSI” on TV taught him that. A spool of fishing line might work. Everybody in the county had a reel, and it wouldn’t take fingerprints. But to be safe, he’d get a pair of work gloves from the pickup to handle everything. He stripped to keep sweat from ruining his clothes. Buck naked, he scrounged enough rocks to fill two burlap sacks he found along the shoreline. Panting from his efforts, he lashed the frail, dead form to the bags with yards of filament. Man, even her thick hair looked different now. Lost its luster. As he struggled to lift the trussed-up package, he slipped and fell on his face. He fought his way to his feet as the first raindrops crashed through the overhanging branches. When he rolled her into the slough, she slid a couple of feet and stopped. He recoiled as her big eyes stared at him. He swiped his running nose and steadied himself. The weighted sacks had turned her in the shallows. She wasn’t looking at him. She wasn’t looking at anything. He overcame an aversion to the revolting stew of sediment and noxious ooze and waded into the water, struggling with the bundle while trying to ignore thick muck squishing between his toes and snatching at his ankles like spectral fingers. Oh, hell. Where was that water moccasin? He fought to keep from bolting back to the shore. Fat raindrops raised pimples on the dark water, making it come alive. Green at the edges, the lagoon turned black toward the middle. Poisons leached up out of the ground, probably eating away his flesh. Grabbing the body before he freaked himself out, he heaved with all his strength. His feet shot out from under him. He went down hard in the slimy mud. The girl seemed to clutch his chest. With a mindless squeal, he shoved her away and scrambled to find purchase on something solid, but the slippery bottom betrayed him. He floundered helplessly as Sourwater sucked him into her depths. He fought his way to the surface, splashing like a five-year-old who couldn’t swim. Reason returned, but not before he took a mouthful of filthy water. Coughing and gagging, his insides burning, he clawed his way to shore and threw up on the muddy bank. While he struggled with his heaving stomach, a bolt of lightning struck a dead tree across the lagoon. Ear-splitting thunder left his head spinning. He tasted ozone on his tongue. His hair stood on end. Nerve endings sang like they were plugged into a live socket. That had been close. He snatched a look at the water, half expecting her to rise from the depths and come for him. But she was gone. Sourwater had her.. He studied the smoldering, lightning-struck snag across the way before raising his chin to the heavens and laughing uncontrollably. Spooky place to take a girl for a romantic assignation… but like the mysterious “he,” said, she was usually up for anything. But apparently not Sourwater. But was his date’s death an accident or “accidently on purpose?” Interesting. Maybe Don (the other Don) will give us another look down the line. By the way, several readers had comments on the podcast interview Traci HalesVass of Radio KSJE did on The Bisti Business. Apparently, my voice didn't sound as weird to others as it did to me. We're scheduling another interview for sometime this summer with Abaddon's Locusts as the subject. I'm including the link in case you haven't listened to the podcast as yet. 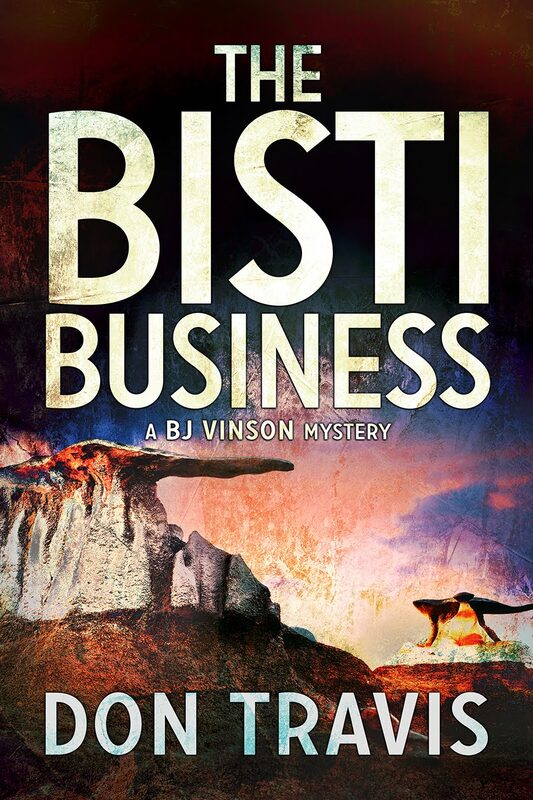 DEAR READERS, Radio Station KSJE in Farmington, New Mexico did an interview with me about The Bisti Business. Click on the link provided below (or copy it) to listen to the interview. I'd also like to thank Traci HalesVass, Professor Emerita of English and host of the program Writers on 4 Corners on KSJE 90.9 FM, who conducted the interview. Given that we’ve concentrated on my later BJ Vinson books, this week, I’d like to call attention to the first one. 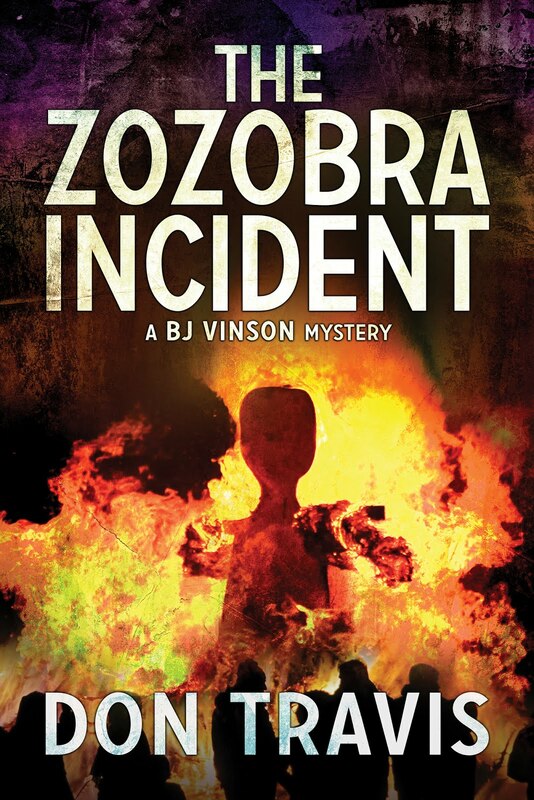 The Zozobra Incident, released in 2016 by DSP Publications, introduced Burleigh J. Vinson (known as BJ to everyone but two individuals in his world), the former marine, ex-APD detective turned confidential investigator. That’s also when he met his companion, Paul Barton. We stood and craned our necks to do some more people watching. Just as I figured my back was going to give out, a blare of trumpets heralded the approach of the traditional procession from St. Francis Cathedral. The Conquistador Band approached the base of Zozobra’s stage from a gate that spared them from having to squeeze through the mob. Immediately, the Star Spangled Banner blared through the speakers, and the crowd sang…no shouted along. Then the tempo switched from triumphant to funereal. Black-robed and hooded Kiwanis members led the parade bearing the effigy of the Mother Mary in the persona of La Conquistadora. Gloomies, eight- and nine-year-old children who dance as ghosts around Zozobra, preceded the Fire Spirit Dancer, the Queen of Gloom, Gloom Princesses, handlers, dignitaries and a seemingly endless host of others. I hope this sparked some interest in The Zozobra Incident for those of you who haven’t read the book.